University of Delaware biologist Anja Nohe is testing a discovery that may yield better treatments for osteoporosis. Osteoporosis researchers (from left) Anja Nohe, Jeremy Bonor and Hemanth Akkiraju examine samples of bone and cells, which will be analyzed to measure bone thickness and growth. 2:48 p.m., March 7, 2014--Anja Nohe calls osteoporosis “a significant disease and a silent disease,” afflicting some 10 million Americans and leading to more deaths  from osteoporosis-related fractures  among women in the U.S. than breast and ovarian cancer combined. The condition weakens the bones and becomes increasingly common, especially in women, with age. Nohe and her research team are working with a specific peptide  peptides are chains of two or more amino acids  that she developed. In early tests the peptide appears promising for attacking osteoporosis on two fronts, by reducing the loss of bone that occurs with the disease and by simultaneously creating new bone. The National Institutes of Health recently awarded Nohe a five-year, $1.65 million grant to support her work in conducting further research on the peptide. 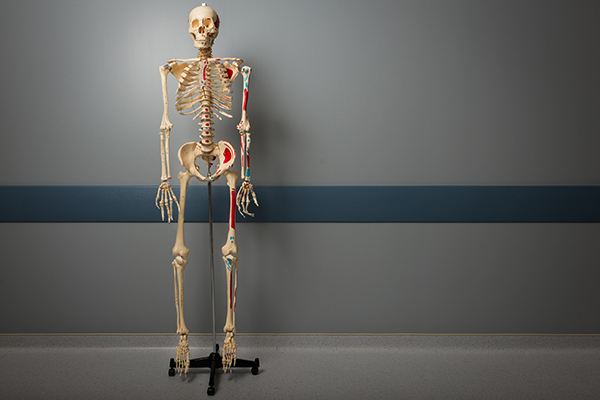 Bone is a living tissue that, throughout a person’s life, is continuously being renewed as old tissue is reabsorbed and replaced by new tissue to the extent that, as Nohe said, “Every 10 years or so, you get a new skeleton.” In osteoporosis, bone loss is accelerated, and less of it is replaced. The peptide, she said, seems to accomplish that goal, by inducing bone formation while reducing the reabsorption of existing bone tissue. In her NIH grant application, she noted that low bone-mineral density leads to 1.5 million fractures a year, at a cost of about $19 billion and with a dramatic effect on the patients’ quality of life. “New treatments for osteoporosis are desperately needed,” she wrote. Nohe and her research team are now using a mouse model as they seek to better understand how the peptide works, with the hope that they can eventually use that knowledge to move into clinical trials of the potential treatment. 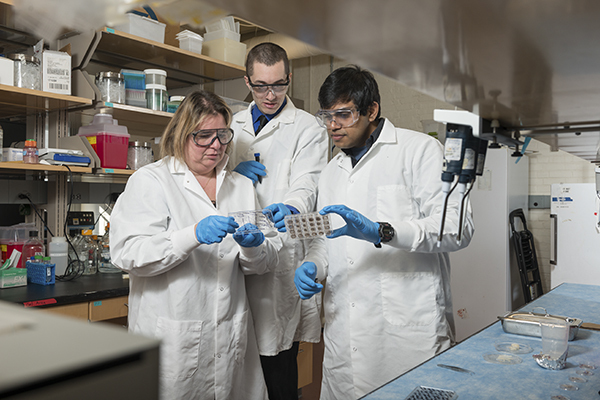 At UD, her team includes doctoral student Hemanth Akkiraju and research associate and lab manager Jeremy Bonor. She credited both of them  as well as colleagues at the Jackson Laboratory in Bar Harbor, University of Maine and Maine Medical Research Institute, where she began working with the peptide  with providing invaluable help in her research. Additionally, she said, the bone research group at UD helped her expand her expertise in bone biology. A chemist by training who later specialized in biophysics and cell biology, Nohe said she relied on those colleagues as she developed her knowledge of bone biology and her research techniques. “I couldn’t have done this work without the right collaborators, and I’m so grateful to have found them,” she says. UD’s bone group includes Nohe’s mentor and investigator on the grant, Randall Duncan, professor and chairperson of biological sciences and professor of mechanical engineering; Liyun Wang, associate professor of mechanical engineering; Christopher Price, assistant professor of biomedical engineering; and Robert Sikes, associate professor of biological sciences.